The cover of this one goes to Monaka, the newest of Yasuomi Umetsu's heroines featured in Kite Liberator. 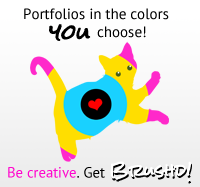 I loved the title text design. 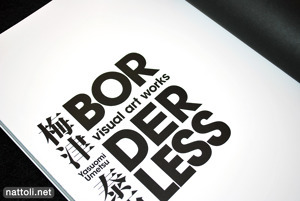 It really isn't as often as you'd think that an art book places some emphasis on typography. 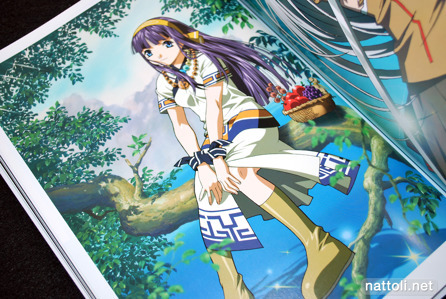 The first section of illustrations are from Kite Liberator, covering a total of 15 pages with 13 illustrations (two of which are two page spreads). The majority of the illustrations are from the DVDs, since OVAs aren't really heavily featured in anime magazines. 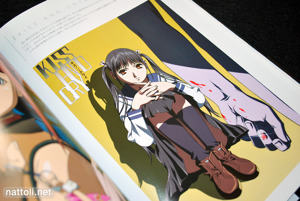 But a couple of the illustrations were originally published in Megami Magazine and Animage. Kite is next, with a smaller section of newer art work from the international version and premium collector's edition of the DVDs in 2007. The art work from the UMD edition of Kite is also featured. In total, the section is 11 pages with 12 pieces of art work. About four of the illustrations also appear in Yasuomi Umetsu Art Works Kujuku but are printed in much higher quality in BORDERLESS. Aside from that, there isn't any overlap between these two books. 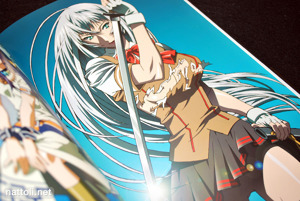 Mezzo Forte also had a small showing, with 7 pages and 8 illustrations. Most of the art works also appeared in the Mezzo Perfect File, but there were two newer ones for the international DVD and the UMD release of the OVA that weren't in the other book. Mezzo DSA turns out to be the largest section in the book, with a total of 39 pages and 37 illustrations, with two of them spread over two pages. This section is filled with goods illustrations from DVD covers, VHS covers (really), and CD covers. I didn't realize anyone still bought VHS... but hey, they had different art from the DVDs so that makes it worth it, right? Also included are four of the illustrations done for Toranoana promotional goods with Mikura and Asami. 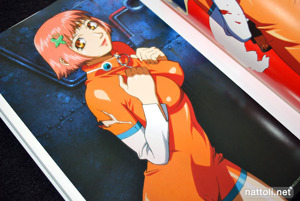 The last section of color art work in the book consists of illustrations Yasuomi Umetsu has done for other series, along with his own original art works. As you might have seen, he did the art work for the ending credits of Ikkitousen: Great Guardians and this DVD extra illustration shown above. The screen shots of the ending for this and Girl's High are also in the book. Art from the Nakoruru OVA is also included, 5 illustrations in total from that. He was the character designer for the show. Also, his contribution to Code Geass Heroine's Tribute is also included. As for the non-series related works, they are from the doujinshi covers of his Comiket releases, which generally are black and white and include key frame sketches. The illustration portion of the book pretty much ends on page 96. From this point on, it's a combination of interviews, screen shot endings and key frame sketches that Yasuomi Umetsu has worked on. Also, he used to do the black and white illustrations that were used for the movie reviews in Animage Magazine, and some of those are included as well. 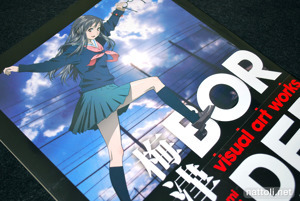 At the very back of the book are 4 guest illustrations, one of which is by Niθ. FYI, your RSS feed is only including post summaries. This means everyone has to open each post individually to read them. The point of an RSS reader is so we can read everyone's blogs in the same place, with a single interface, and not have to load dozens of websites. Please let the RSS feed include full text. Right now the RSS feed is primarily for affiliates like 9rules and pireze to get a list of latest posts to show on their sites. I think it's definitely worth having both Yasuomi Umetsu Art Works Kujuku and Yasuomi Umetsu's Visual Art Works BORDERLESS. There's barely any overlap (4 pictures) and having them both is like, a complete set of all his works. Yeah I wasn't sure whether you were just showing all the new images and not showing the old. I think I might try get this soon, thanks for the info!